Free plastic bags were first introduced to the Guangdong province when China’s commercial sector boomed in the 1980’s. The bags were embraced for their low cost, light weight, and ability to withstand various weather conditions. However, decades of use have resulted in a use-and-discard habit; it is estimated that prior to the ban, 3 billion plastic bags were used daily across China (this roughly translates to an annual consumption of 800 bags per person, compared to 600 bags per person in Seattle). 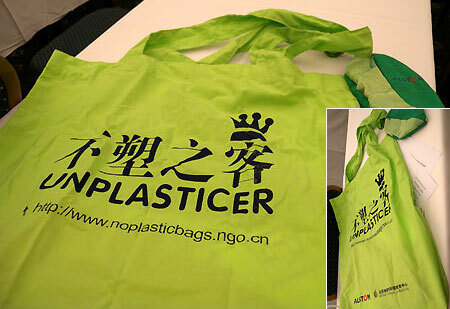 On April 16, 2008, the Order of the Ministry of Commerce, the National Development and Reform Commission and the State Administration for Industry and Commerce met to discuss ways to reduce plastic bag usage throughout China. Their goal was to reduce “white pollution”, conserve resources and protect the environment. The government also probed for ways to encourage recycling programs, promote reuse of disposable bags, and introduce substitutes to reduce the burden on small chain stores and farmers markets. The General Office of the State Council passed legislation to regulate the production, sale and use of ultra-thin bags less than 0.025 mm thick on June 1, 2008. Following this date, retailers were banned from providing free plastic bags to customers, despite using them for more than a decade. The State Administration of Industry and Commerce threatened to fine non-compliant retailers anywhere from 5,000 to 10,000 yuan (equivalent to $667 to $1,470 USD). Since March, the State Administration for Industry and Commerce trained and deployed 600,000 law enforcement regulators to inspect 250,000 retail stores for free plastic bags. Because the legislation only applies to thin plastic bags, the Qingdao Industry and Commerce Bureau in the eastern Shandong Province invested 60,000 yuan (about $8,780 USD) to buy 120 instruments to measure the thickness of plastic film. So far about 2,000 cases have been investigated and 2 million yuan ($300,000 USD) in fines have been issued. Even after a year, it is unclear how successful the ban on free plastic bags has been. Plastic bags are a major export of China and the legislation has resulted in job losses in the plastics industry. Suiping Huaqiang Plastic Co. Ltd., China's largest plastic bag manufacturer, shut down last year after the bag ban was announced. The 20,000-worker company once produced 250,000 tons of bags valuated at 2.2 billion yuan (about $322 million USD) on a yearly basis, but 90% of its products were banned by the law. New labor laws also led to higher wages that the company could not afford. Enforcement of the ban, especially in rural areas, is another challenge. One article states that although some cities handed out 65-70% fewer plastic bags, over 80% of agricultural trade markets and retail outlets in rural areas ignored the ban. Another survey by Global Village found that in Beijing, nearly 96% of open food markets continued providing ultra-thin plastic bags and nearly 85% offered free plastic bags to customers, provoked by the fear of losing customers to competitors. While the intention to curb plastic bag consumption is noble, the application, enforcement, and cost of the program is impractical. A news bulletin from the official Chinese news portal explaining the new policy towards the distribution of thin plastic bags. A World Bank report on waste management in China. Includes data and analyses concerning solid waste streams, encompassing data on plastics waste in selected countries. “Fact Box-Plastic not Fantastic? ; Bag bans around the world,” Reuters, May 27, 2008. (accessed June 10, 2008). Reuters reports China’s outlaw of ultra-thin plastic bags to take action on June 1, 2008. China is taking action in an effort to reduce pollution and increase resources. Reuters provides are descriptions of other countries current actions being taken to reduce and restrict the use of plastic bags; included is San Francisco, CA’s grocery bag outlaw. Addresses China’s styrofoam pollution problem which has earned it the nickname “The white Great Wall” and “white blanket”. Lists the aftermath of the disposable Styrofoam tableware ban and suggests that recycling and reprocessing programs are better solutions to rectifying tableware pollution. A year after the ban on free plastic bags, a research firm called Global Village released a survey on its progress and discussed its finding in a conference. Pictures of bag alternatives and the events are found at this site, as well as a summary of survey results. This article addresses the progress of China’s plastic bag ban. In particular, plastic bag usage and the enforcement of the ban on free plastic bags are discussed in detail. This source provided helpful links to articles from World Watch and China Daily and included several figures on consumption habits and fines. Huaqiang, China's largest plastic bag manufacturer stopped production of LDPE/HDPE plastic bags in light of a government policy that bans the free distribution of 90% of its manufactured products. The 20,000 employees of the factory were forced to reduce production in January 2008 to meet the drastic demand reduction.